"Linda Ipanema gives a song a personal feeling. Hearing her distinctive sound generates the same sense of excitement I first felt when Barbara Streisand was my TV vocalist. Her great vitality generates the crowds to fever pitch." "From the red hot mama Sophie Tucker school of singing, with some Kay Starr brass added, Ipanema is boisterous, fiery, and passionate in her delivery, recalling the days of music halls, revues, and vaudeville. Ipanema's showmanship comes through loud most times, softer other times, but always clear." "As I approached the Daily News stage, a loud clear voice could be heard. Over the heads of the crowd I saw this slight built woman with a big voice. She was Linda Ipanema of the Dixie Cats. She was in a Time Machine because she belted out tunes that go back to the Swing Era. Linda had the crowd in her hands. They were clapping and moving to the beat. There was joy in her voice along with great vocal talent." "Thank you and the Dixie Cats for the fantastic Dixieland concert. Your choice of music was perfect and your energy and enthusiasm had them literally dancing in the isle!" Linda Ipanema, also known as the "Queen of Dixieland," is considered one of the foremost singers of Dixieland jazz. Linda has been in show business most of her life. In addition to stage Broadway musicals she has appeared in leading films, such as, "A Bronx Tale," "The Pope Of Greenwich Village," "Once Upon a Time in America," and in hit TV shows, such as, "Law & Order." Linda is a long-time member of the prestigious Actor Studio where she has done plays as well as serving as singing MC of their Christmas shows, in which she delighted her acting peers with her vocal and comedy skills. That inspired her to do a series of cabaret performances, which led to two seasons as the opening act for Ray Romano and other popular comics at the legendary comedy club The Improv in the early 1990s. She also was vocalist with Bob Cantwell and his band at the Red Blazer, which was instrumental in forming her own band in 1994. Around that time she decided to concentrate on her favorite activity, belting out old-time tunes, and formed her current group Linda Ipanema & the Dixie Cats, which is drawn from the best Dixieland players in the Metropolitan area. It is a self-contained band with a rhythm section and 3 horns (trumpet, clarinet, and trombone). Featuring Dixieland Swing Music, Linda has performed in all the major clubs in New York City and Metropolitan area, festivals, outdoor concerts, including the Showboat in Atlantic City, as well as in Washington DC, Delaware, N. Carolina, Florida, and Norway. 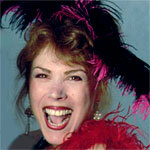 Linda sings, dances, and wisecracks into the hearts of audiences of all age groups. Her interaction with audience members is unique. Be prepared to be plucked from your seat for an impromptu dance with Linda. You may wonder with her busy schedule, how does she find time to team up with her husband Stan Edwards to do gigs. Well, folks, it's a labor of love (that everyone seems to love). They're currently working on their CD together, as well as their various themed shows, such as the latest Everything's Rosie (a toast to late and great Rosemary Clooney).